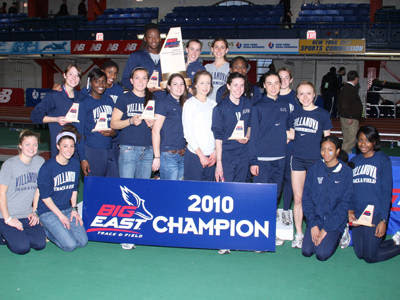 For the first time in ten years, the Villanova women have won the Big East Indoor title. The 4 x 800 victory in the next-to-last event of the meet pushed the Villanova team past Louisville and to an 8-point team victory. Junior Sheila Reid, a Bowerman Award finalist, was named the meet's Most Outstanding Performer on the woman's side. Reid won the conference title in the mile (where Reid, Nicole Schappert, and Brooke Simpson went 1-2-5 in the final), the 1000 meters (where Reid and Nicole Schappert went 1-2), and anchored the conference champion 4 x 800 meters relay team. Junior Alison Smith won the 3000 meter conference title. The Villanova women also won the DMR.